I recently tried this new restaurant at the Viceroy Miami on my way to happy hour at Area 31 which is just across the river. 15th & Vine is located on the 15th floor of the Viceroy Hotel and overlooks the pools that serve the hotel as well as the Icon apartment buildings. The mood is modern, trendy and unfortunately for them, empty. When we first arrived many different staff members greeted us and sat us down. We sat outside, partly due to the fact that the indoor dining area must have been set to 40 degrees! It was freezing! Even sitting outside you could feel the cold draft of the A/C. However, they were nice enough to offer shalls to the ladies dining outside. Anyways, perusing the menu, we quickly asked for any happy hour specials. They returned with a happy hour menu that included $5 cocktails until 8PM. I didn’t like any of the choices, they were very girly, sweet drinks. The food menu has tapas style dishes as well as platters and flatbreads. For the tapas, you can choose any 2 tapas for $15 or 5 tapas for $35. My friend and I decided to split the 5 for $35 option. 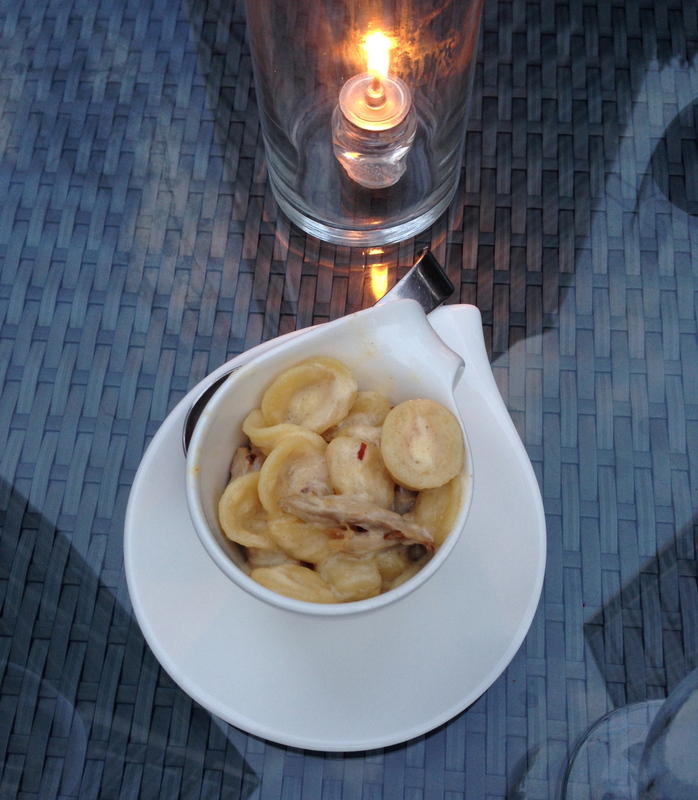 First up; the duck confit mac and cheese. The only good part about this dish was the surprising amount of duck; a few good hearty pieces. However, overall I didn’t like it. The cheese tasted like it was a powdered cheese formula. Instead of the cheesy and creamy mac and cheese we all love, it was on the grainy side. As far as taste, that was lacking too! Oh and did I mention the tiny portion? We quickly got the picture that tiny portions were in our future. Next was the dungeness crab roll. I didn’t know what to expect, but when the waiter presented this “roll” to us we were all confused. 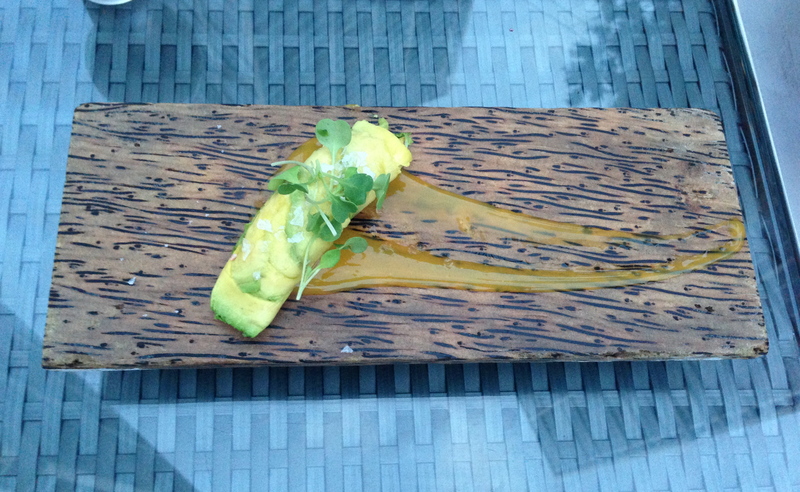 It contained mixed crab inside avocado. We couldn’t believe the portion, it was about the length of my middle finger. 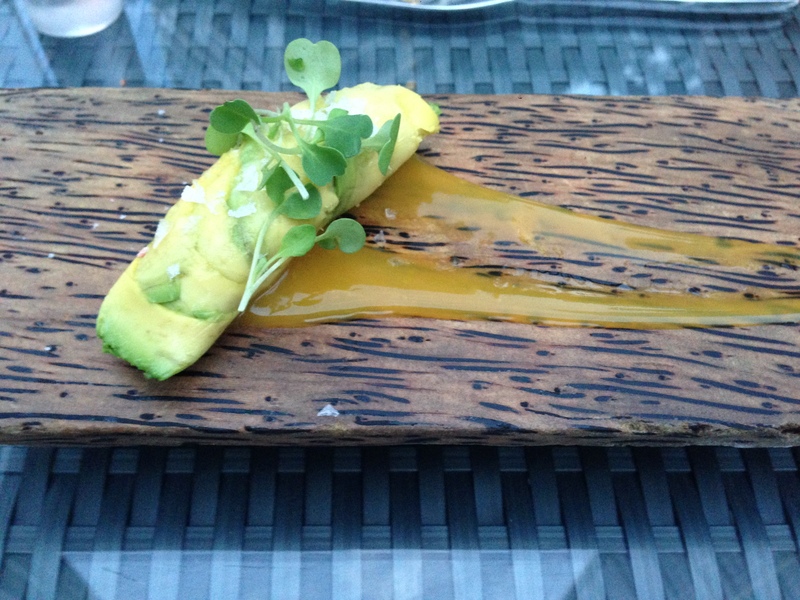 The dish was overpowered by the crystals of salt they included inside and on top of the roll. All we tasted was salt and when we advised the waiter he responded that it was the chef’s desire to have large pieces of salt in the dish and it was part of the flavor profile. 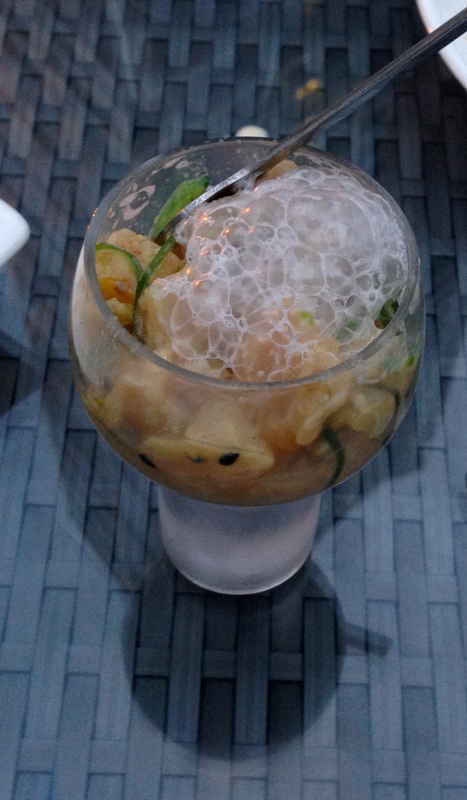 The mahi mahi ceviche was served in a glass smaller than a shot glass. The ceviche was very average and lacked a lot of flavor. The mediterranean quinoa had feta cheese, cherry tomatoes, cucumber, roasted red pepper, and kalamata olives. Again, very average dish. The quinoa was on the soggy side but I imagine it’s because it was mixed with the other ingredients. But, I prefer quinoa to be fluffy. 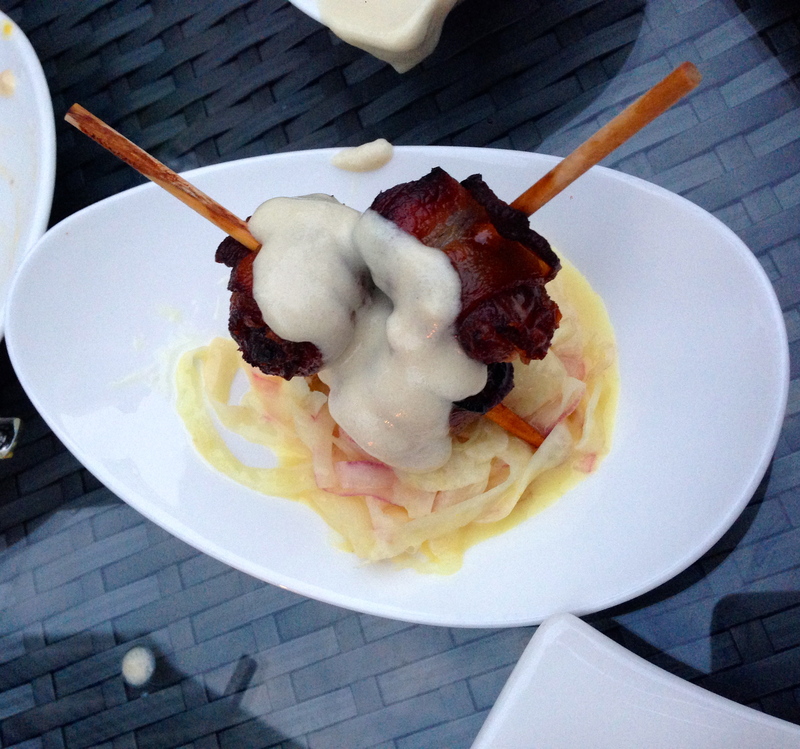 The bacon wrapped dates were the best part of the meal. But, how can you go wrong with bacon and dates?! The 4 pieces were topped with blue cheese fondue and had a marcona almond on the inside of the date. My boyfriend opted for a flatbread (wise choice) and ordered the Shrimp, Aji Amarillo, Citrus Escabeche flatbread. It was pretty light and crispy and had a nice amount of shrimp on it.